Public policy-makers play an important role in promoting social innovation. They can support or partner with the types of social enterprise models highlighted in the second section of this report, and they can also enable the development of impact investing strategies that channel private capital to create measurable social and environmental benefits. Government has a critical stake in new business models that provide public benefits. As a result, government is sometimes an early provider of resources to new enterprises through grants and investments or a customer through the procurement process. And for the intermediaries and infrastructure on which social enterprises depend, government can provide stability for nascent markets. Policy-makers may see these new markets as a way to leverage and maximize limited resources and to deliver public services as efficiently as possible. But this work requires close coordination between public, private and civil society stakeholders to move from policy goals to practical results, which can be complex. While policy is not the only solution to bolster this emerging sector, it can play a catalytic role in mobilizing effective resources to build a supportive system, encourage innovation and ensure the effective delivery of public benefit. These 12 policy snapshots – drawn from Africa, Asia, Australia, Europe, North America and South America – share the explicit objective of engaging the private sector to address social and environmental challenges. They illustrate the range of actions that government can take as a market catalyst, including investing directly in social enterprises and intermediaries alongside private investors; providing resources for capacity building and technical assistance; acting as a central hub for programme administration and stakeholder convening; and setting the rules of the game through tax and other regulatory policies. The policies in this report were selected for inclusion because they target social enterprise and impact investing directly. The current abundance of policy experimentation, providing a range of options from which to choose, indicates significant forward momentum in recent years. But because the policies aim to develop these emerging fields, they are also relatively recent with limited performance track records on which to evaluate success or failure. The policies should therefore be considered indicative of increasing governmental efforts to harness the power of private enterprise for public good, but they are neither the only solutions available to policy-makers nor necessarily the best solutions. For many of the policies, there is simply not enough data to make any assertions regarding performance, although that was not the goal. It is important to note that the policy snapshots embrace a broad conception of social enterprise and entrepreneurship. On a local or national level, the activity of social enterprise can include anything from the delivery of socially-beneficial goods or services, to an operational strategy grounded in social purpose by being located in, hiring from, or otherwise engaging with disadvantaged areas. Ownership structure and corporate form are also distinguishing features of social enterprise in some places. And while the snapshots do not include a specific example of an innovation in corporate form, such as Community Investment Companies in the United Kingdom or Benefit Corporations in the United States, it is an area of emerging policy interest, albeit more specific to country context. Taken together, the 12 examples are intended to provide readers with entry points into the policy process for developing social enterprise at all stages – from idea to implementation. The cases are valuable in their own right as windows into the dedicated efforts of government to support social innovation. However the Framework for Government Action also links the 12 cases together to look beyond the historical, political, social and economic particularities of the single country in which each is grounded. 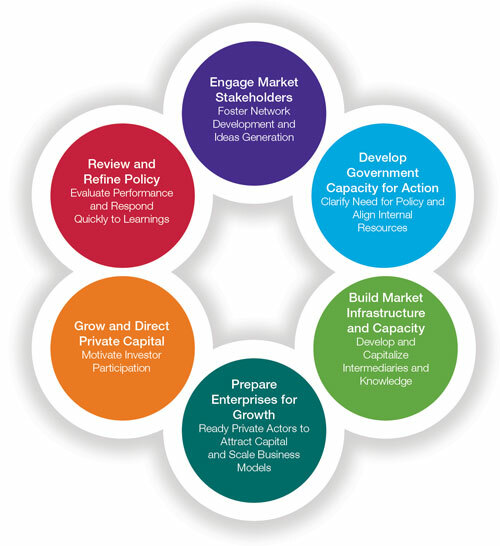 In this way, each policy highlights a fundamental role in the cultivation of social enterprise and innovation – from identifying social innovation through stakeholder engagement, to developing capacity for public-private initiatives, to attracting private investment for public benefit and providing technical support that helps make enterprises investable. The Framework for Government Action includes six elements of public effort to bolster social enterprises, incorporating a sequential logic that may be helpful to readers. However, in practice the interaction between stages of policy development is multidirectional, such that readers should consider each on its own merits and according to its applicability to their own country context. Social enterprise crosses many sectors, industries and bureaucracies; a crucial role government can play is breaking down the existing silos that prevent growth and promoting the generation and sharing of ideas. Engagement can take various forms, from catalytic gatherings to longer-term initiatives, but a unifying component to any policy is the development of structures that allow communication and coordinated action between investors, entrepreneurs, civil society and policy-makers. 2. The National Innovation Council in India was created in 2010 to develop a “National Roadmap for Innovation” over the next decade, acting as a catalysing agent to engage stakeholders and encourage innovation across industries and geographies. To ensure effective and efficient implementation, policy-makers must clarify the need for government action and align internal resources. Depending on the specific policy needs of a country, this capacity can be developed by consolidating existing government activities or developing new departments; the ultimate goal of either approach is providing a hub for innovative partnerships with the private sector. 3. The Department for Social Prosperity in Colombia is the central agency managing government programmes that aim to compensate victims of conflict, reduce poverty and promote peace. As such, the Department plays a critical role in strategically introducing concepts of social innovation and entrepreneurship. 4. The Office of Social Innovation and Civic Participation in the United States coordinates activities of the public and private sectors to support social innovation. The Office also acts as a policy advisor to the US President on issues related to social enterprise and social innovation, helping to create and implement new policies by identifying solutions and evaluating best practices. Successful social enterprise requires the support of a larger system. Government can help build that network by developing and capitalizing intermediaries that capture market data, link stakeholders on specific projects and serve as financial vehicles for investing with social and environmental impact. 5. Big Society Capital (BSC) in the United Kingdom is a cornerstone in the development of a UK market for social enterprise and innovation. Leveraging a combined £600 million (over US$ 900 million) in funding from dormant bank accounts and four of the largest High Street Banks, BSC invests in financial intermediaries that provide funding to social enterprise. 6. The Venture Capital Trust Fund (VCTF) in Ghana has leveraged approximately US$ 58 million to develop and fund Venture Capital Finance Companies that, in turn, provide critical and previously unavailable capital and technical assistance to small and medium-sized enterprises (SMEs). The VCTF is also tasked with developing the investor networks and market infrastructure necessary to grow SMEs in Ghana. To scale the innovations of social enterprise, government can help businesses build capacity, attract capital and increase demand for their products. Again, a variety of policy tools are available to prepare enterprises for growth, from technical assistance to direct investment; the appropriate policy solution should be grounded in an understanding of the needs of entrepreneurs and their current obstacles to scale. 7. The Investment and Contract Readiness Fund in the United Kingdom is a cross-sector fund managed by a third party, The Social Investment Business, providing grants for technical assistance to social enterprises seeking new forms of investment or competing for public service contracts. 8. Mi Chacra Emprendedora in Peru develops the capacity of rural entrepreneurs and households living in poverty by expanding and diversifying income-generating activities and encouraging farmers to bring new products to market. Capital is a crucial component to develop and scale social enterprises. Government can incentivize private investors to participate in the social investment market by using policy tools that create new channels for private investment in social enterprise, introduce subsidies to support expanded capital flows or remove regulatory barriers that prevent interested investors from participating. 9. Program-Related Investments in the United States expand the pool of capital available to social enterprises by allowing foundations to count below-market rate investments against the annual payout they are required to make in order to retain their tax-exempt status. 10. Community Economic Development Investment Funds in Canada provide new funding options to local businesses and social enterprises by pooling capital from the sale of tax credits to individuals. To ensure that the intended impact is met, government can build systems for evaluating performance and efficiently revising policies. This step must be repeated throughout the policy design process, from the outset and at regular intervals after implementation. The willingness of a government to review and refine policy is imperative to success. 11. Social Benefit Bonds in Australia modified a social investment product first implemented in the United Kingdom, creating a similar product tailored to the local context in the state of New South Wales. As the Social Benefit Bonds policy continues to be developed in Australia, evaluation and refinement have been key to its implementation. 12. The Micro-Credit Company Pilot Programme in the People’s Republic of China has been developed and refined from the experience and challenges identified in the initial programme. Today Micro-Credit Companies provide improved lending regulations and financial services for entrepreneurs in rural areas throughout the country. 1 These policies and actions were outlined in the 2011 report entitled Impact Investing: A Framework for Policy Design and Analysis. Available at: http://www.pacificcommunityventures.org/reports-and-publications/impact-investing-a-framework-for-policy-design-and-analysis/.